Tropical lizards may be slow. But they aren't dumb. They can do problem-solving tasks just as well as birds and mammals, a new study shows. A Duke University experiment tested Puerto Rican anoles on several cognitive tasks and found they can learn and remember to solve a problem they've never faced before. The results challenge the scientific stereotype that reptiles have limited cognitive abilities and methods for finding food. The lizards' success on a worm-based test normally used on birds was "completely unexpected," said Duke biologist Manuel Leal, who led the study. He tested the lizards using a wooden block with two wells, one that was empty and one that held a worm but was covered by a cap. Four lizards, two male and two female, passed the test by either biting the cap or bumping it out of the way. The lizards solved the problem in three fewer attempts than birds need to flip the correct cap and pass the test, Leal said. Birds usually get up to six chances a day, but lizards only get one chance per day because they eat less. In other words, if a lizard makes a mistake, it has to remember how to correct it until the next day, Leal said. He and Duke graduate student Brian Powell describe the experiment and results online in Biology Letters. 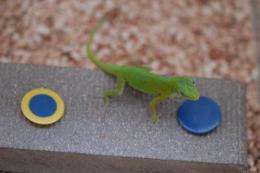 Leal's experiment "clearly demonstrates" that when faced with a situation the lizards had never experienced, most of them were able to devise a way to solve the problem. Their ability to "unlearn" a behavior, a skill that some mammalian species have difficulty in, is the mark of a cognitively advanced animal, said Jonathan Losos, a biologist at Harvard who was not involved in the study. The results "should cause researchers to re-evaluate what they think they know about the evolution of animal cognition," Losos said. Leal tested the cognition of the Puerto Rican anole, Anolis evermanni, after seeing sparrows flip a cap to get a worm and wondering if lizards could do the trick, too. "They'd put their snout under the little plastic chip and then quickly bump it," Leal said. "They don't do this in the wild." Even when Leal covered both wells, the lizards chose to flip the cap covering the well with the worm. They had learned to associate the color or brightness of the chip with their reward. To see if the lizards could reverse this association, Leal next placed the worm under the other cap. At first, all the lizards bumped or bit the formerly lucrative blue cap. But after a few mistakes, two of the lizards figured out the trick. "We named these two Plato and Socrates," Leal said. The lizards' performance doesn't necessarily mean that reptiles are smarter than birds, said McGill University biologist Louis Lefebvre, who studies learning and behavior in birds and was not involved in the new study. He said a better way to use these new results would be to compare cognitive abilities among reptile species, rather than between reptiles, birds and mammals. "We know birds and mammals have bigger brains and that within bird species and within mammal species, the bigger the brain is, the higher the chance of that larger-brained species making it when moving to a new environment," Lefebvre said. "It may be the same with lizards." Research has shown that large-brained lizards are better than small-brained lizards at colonizing new areas. "My guess would be that the lizard genus in which Manuel Leal has shown fast learning would be among the larger-brained lizards," Lefebvre said. Compared to other lizards, anoles are better at exploiting diverse habitats and they exhibit complex behavior, factors that may favor the evolution of higher-level mental processing. The lizards' ability to perform on the lab tests may also be an indication of the traits that allowed the group to successfully spread across the tropics, Leal said. He plans to test other species of lizards and compare their brain to body size later this year.